He holds a Master's degree in Computer Applications from the University of Madras. He is a Senior Solution Architect with over 20 years of experience in Java, J2ee, .Net, Mobile, Cloud and DevOps Technologies. He is actively involved in all the project phases (Pre-Sales and Post-Sales, Initiation, Configuration Management, Planning, Design, Architecting, Tracking and Monitoring, Scheduling, Testing, Estimation, Closure, Delivery) in his Projects. He holds experience in Banking, E-Commerce, Travels, Finance, Automobiles, Insurance, Services domains. He has implemented various methodologies ( Waterfall, Spiral, Agile Scrum, Kanban) in his projects. He is a Sun Certified Java Programmer, Sun Certified Java Web Component Developer, Sun Certified Java Architect, Microsoft Certified Visual Studio & TFS Administrator, and PMI Certified PMP. He is currently working as a Senior Solution Architect in Indian Government Project using Angular 8, ESRI ArcGIS, JSF PrimeFaces, Spring, Restful web services, PostgreSQL, MongoDB. 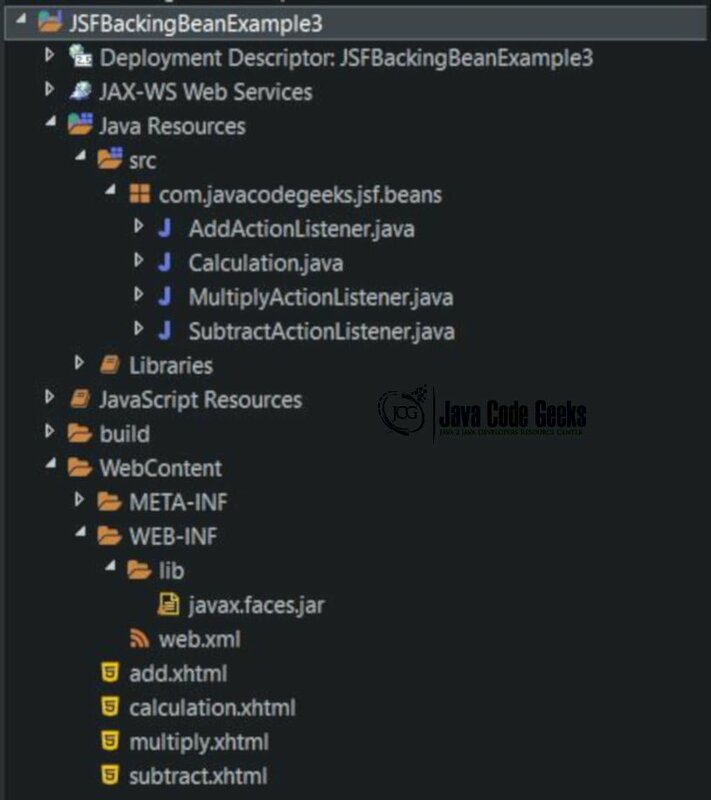 With this example, we are going to demonstrate how to use Backing Bean in JavaServer Faces (JSF) to develop a Web Application by using three programs. 1. What is JavaServer Faces (JSF)? 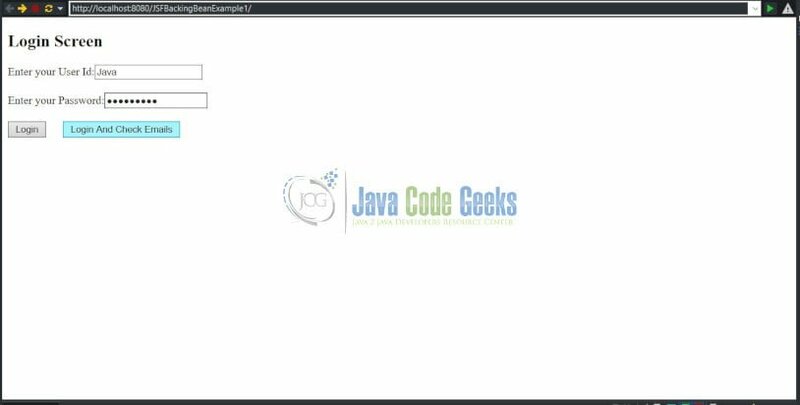 JavaServer Faces (JSF) is used as a Component-based web framework that implements a Model-View-Controller design pattern for developing web applications. Want to be a JSF Ninja? Subscribe to our newsletter and download the JSF 2.0 Programming Cookbook right now! 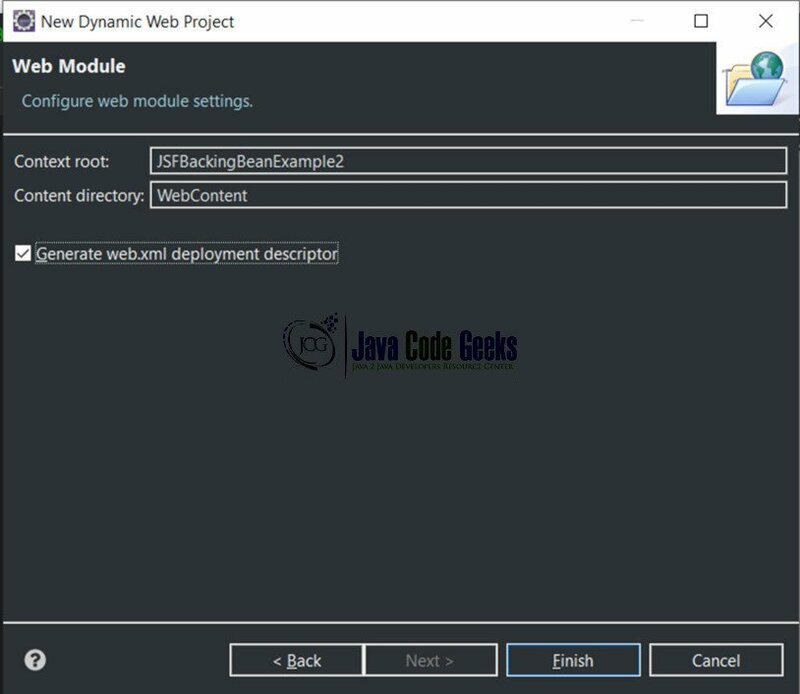 In order to get you prepared for your JSF development needs, we have compiled numerous recipes to help you kick-start your projects. Besides reading them online you may download the eBook in PDF format! It implements the MVC Design Pattern. 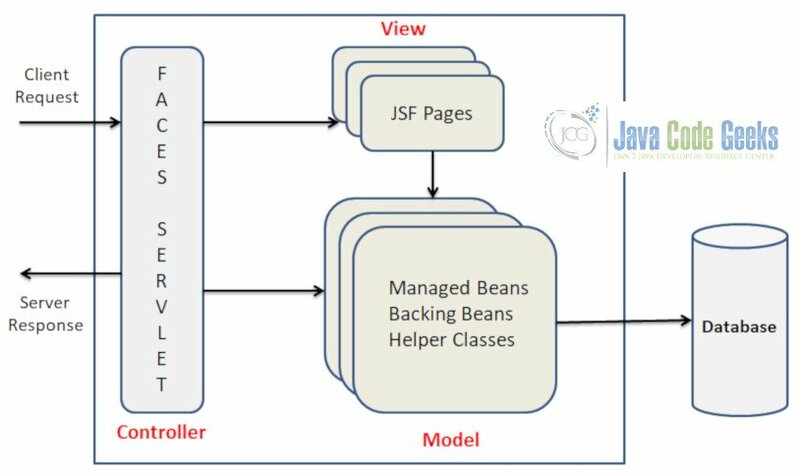 It uses Expression Language that allows JSF Pages to access and manipulate Managed Beans and bind them to UI components. 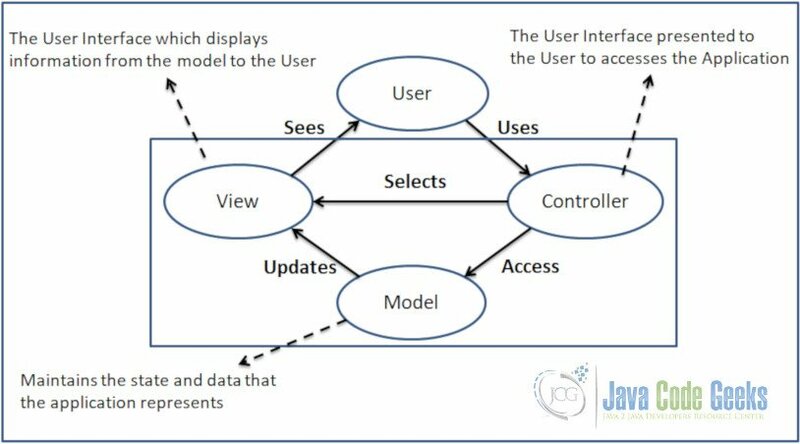 It has Navigation Model explains when and how JSF Page navigation should happen in a web application. It supports HTML 5 and Ajax. It is easy and can be used for rapid web development. It supports Internationalization to create web applications in different languages and regions. 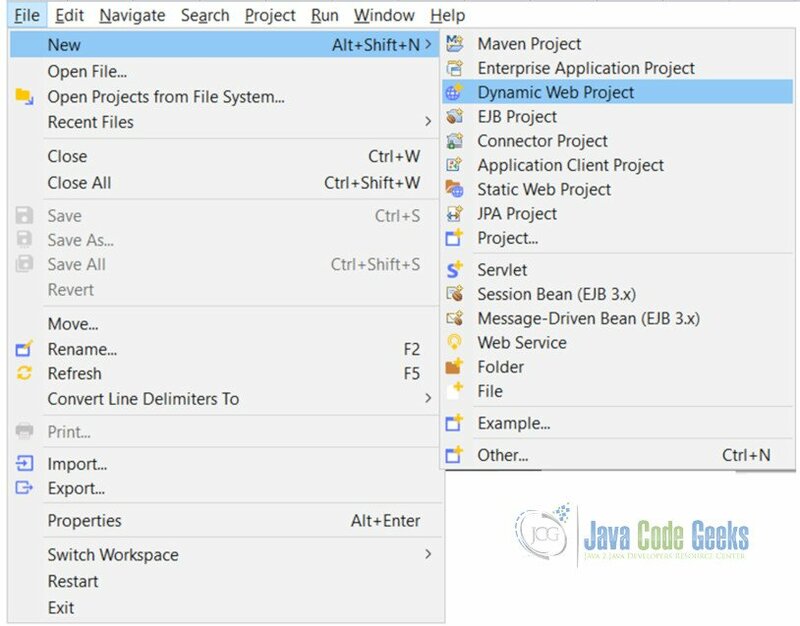 It provides Managed Bean and Backing Bean to offer Inversion of Control (IoC) or Dependency Injection. It handles Data Conversion using Faces Converter System and Validation using Faces validation System. It provides Event-based Programming model. It can be integrated with Spring Framework and JDBC. It uses Core Component Tags Library for validations, converting input values, and loading resource bundles. It uses an HTML Component Tags Library to create and render HTML components. 3. What are Managed Beans? 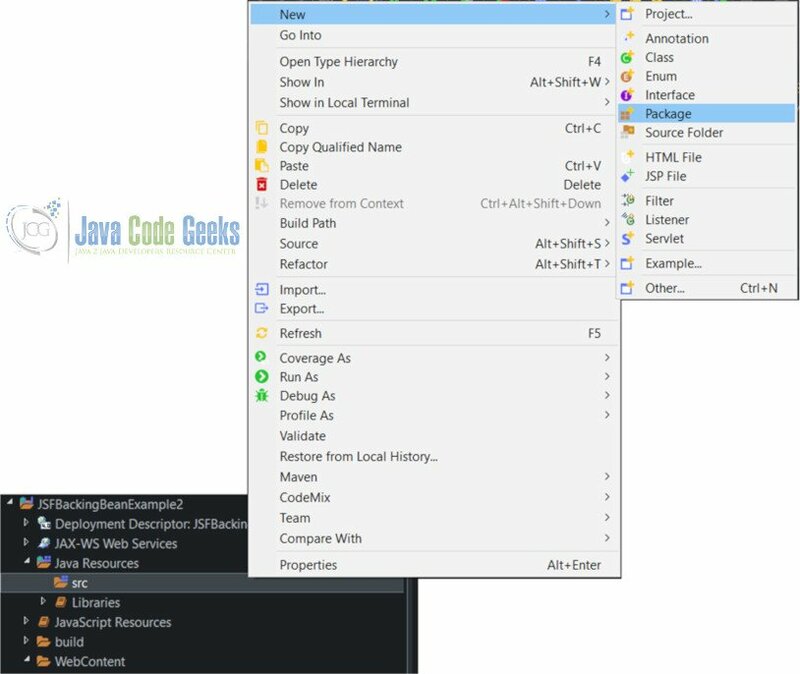 Managed Beans are Java Bean Classes which contains Getter/Setter Methods, Business logic and a Backing Bean. They are loosely coupled to Server Side Java POJOs. It can be declared either in a facesconfig.xml file or through Annotations. They are “Lazily Initialized” by the Container at runtime only when the application needs them. It has various Scopes like Request, Session and Application Scopes. 4. What are Backing Beans? 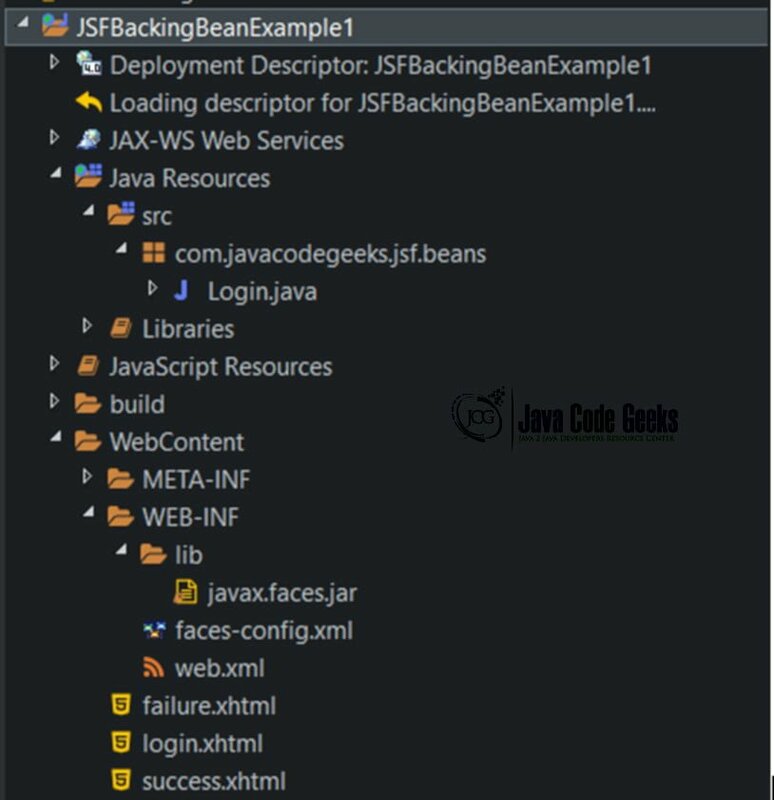 Backing Beans are Java Beans Components associated with User Interface Components in a JSF Page. It contains Action methods, Action Listeners and Value Change listeners that correspond to the UI components that initiate action events. 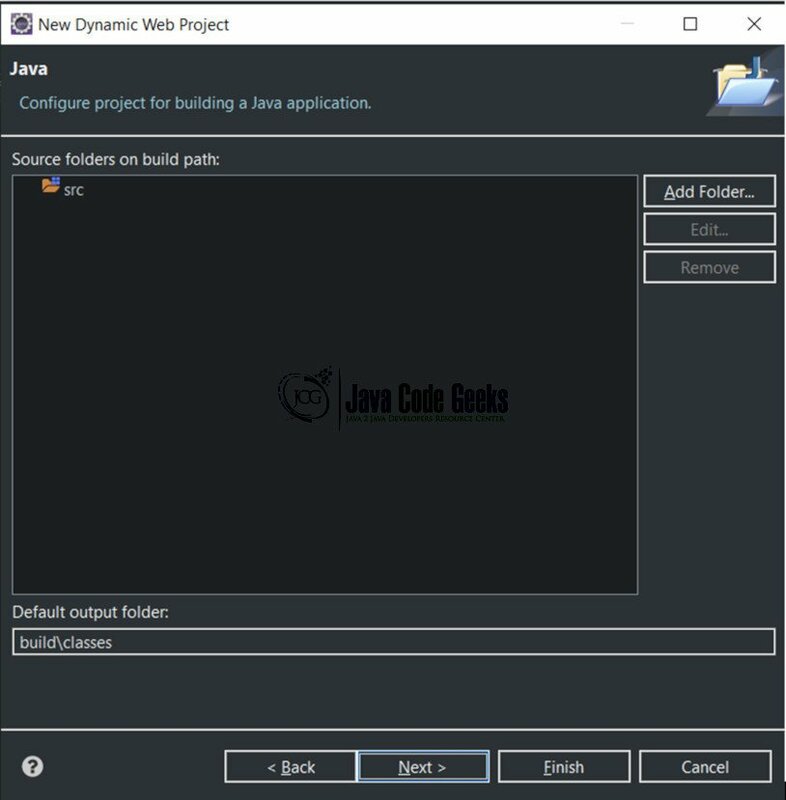 It defines a set of methods that perform the functions such as validates the component’s data, handle events, manages form data and navigation. There will be one Backing Bean for a JSF Page. It is registered in the faces-config.xml file with “_Backing” added to their names to know which beans are backing beans. It participates in the View layer of MVC Design Pattern. The Controller, which handles the user’s requests and dispatches the appropriate view as a response to the User. JavaServer Faces (JSF) strictly adheres to the MVC Architectural design principles by separating presentation (View) code from the back-end business logic (Model) code. It also provides a front-end (Controller) servlet that handles all Faces requests from the Users. It also dispatches the responses back to the users. Model – The Model contains methods and properties in managed beans specified either in the faces-config.xml file or in annotations on the managed bean classes. 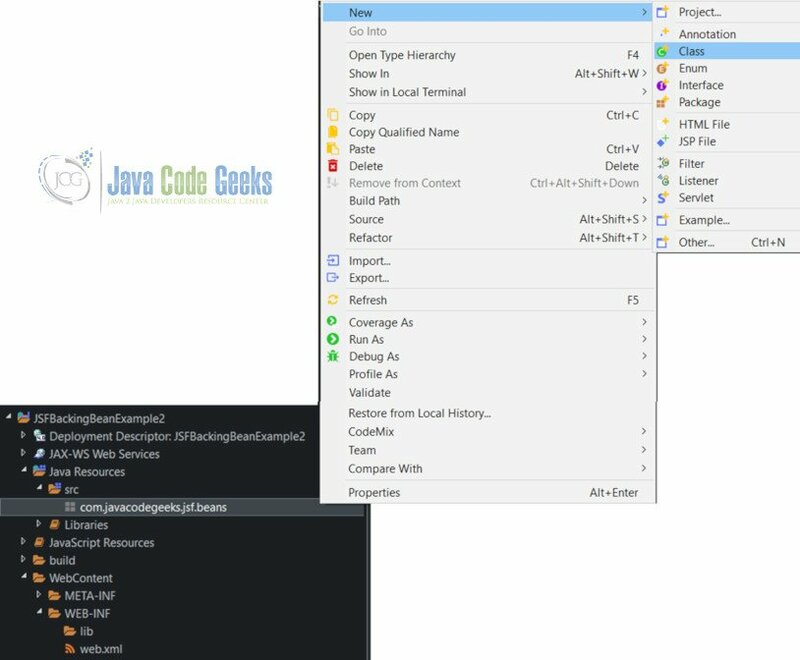 View – The View segment of a JSF application is created using .xhtml files with UI components. Controller – The Faces Controller is implemented as a servlet that responds to all requests conforming to a certain URL pattern, such as /faces/* as defined in the web.xml file. The FacesServlet is provided by the implementation, So, We need not have to write it by ourselves. 8. How to create a Project? 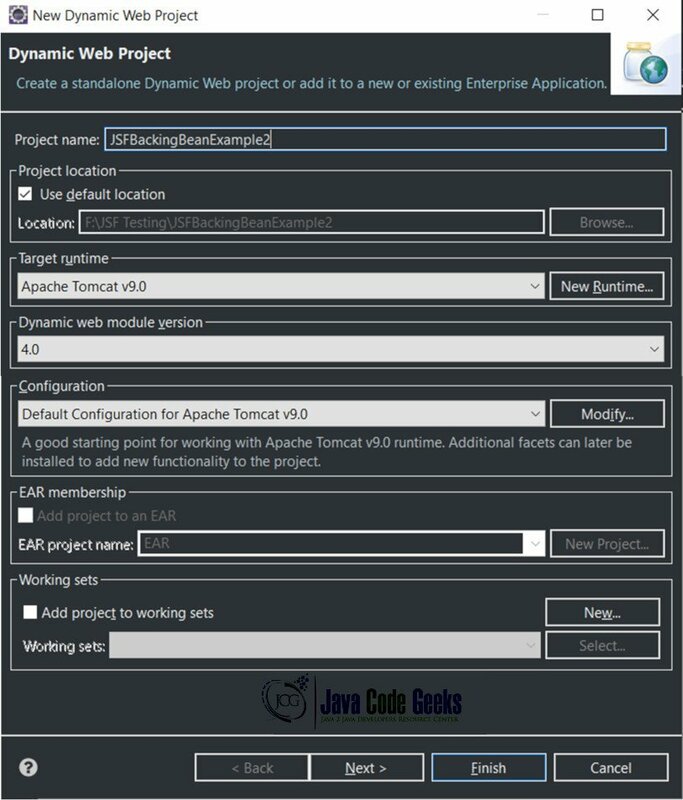 Enter Project Name and Select “Apache Tomcat v9.0” as Target Runtime, as shown below and then Click Next Button. 10. How to create a .xhtml page? 11. How to create a Package? 12. 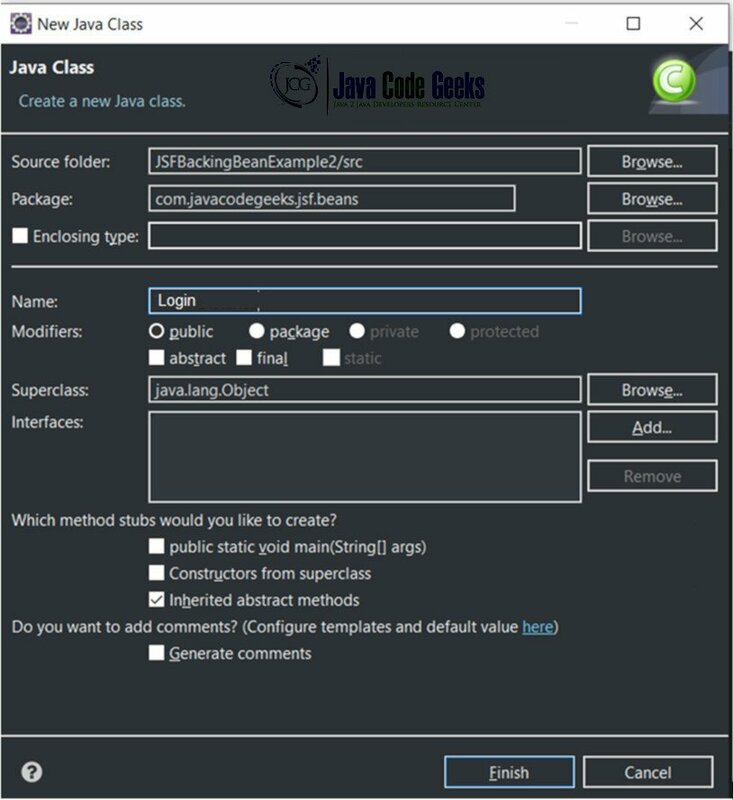 How to create a Bean Class in a Package? 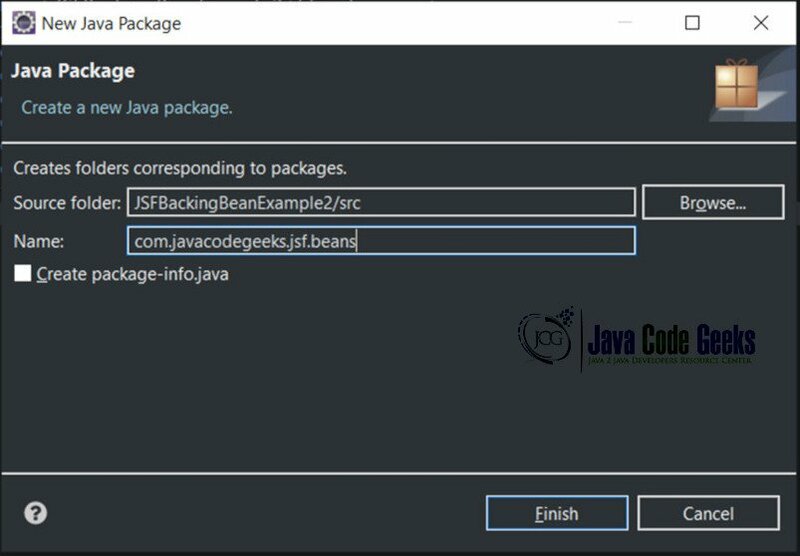 To implement a backing bean, you can create a Java class for each JSF page and register it as a managed bean. It is recommended that backing beans should be declared to be in request scope. It is preferred to have a single backing bean per page. For example, login JSF page (UI component) would have an associated Login.java (backing bean component). It serves as the layer of abstraction between the JSF page and the back-end business logic. Properties corresponding to input fields on a page, such as string properties for User Id and password. Action methods and action listeners that correspond to UI components. Declarations of UI component instances that can be directly bound to the UI components used on the page. 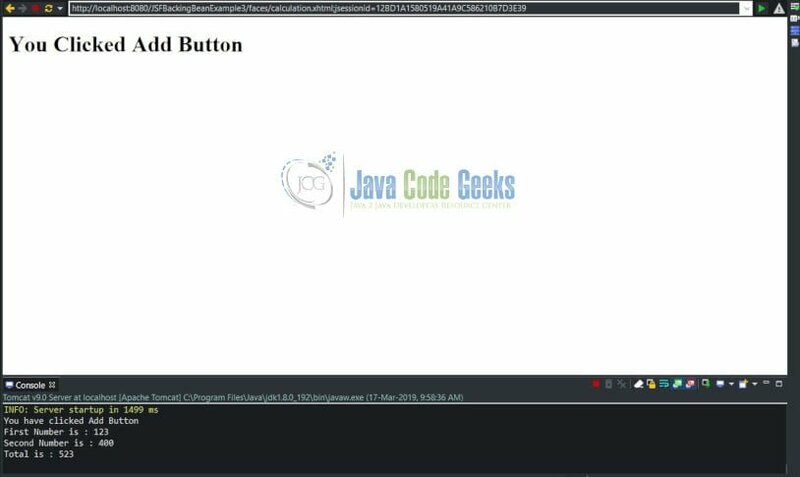 This User Authentication Backing Bean example will have the following files: login.java, login.xhtml, success.xhtml, failure.xhtml, checkemail.xhtml, web.xml, and faces-config.xml. The below screen shows the User to enter User Id and Password, It also allows the User to click the “Login” or “Login and Check Emails” button. 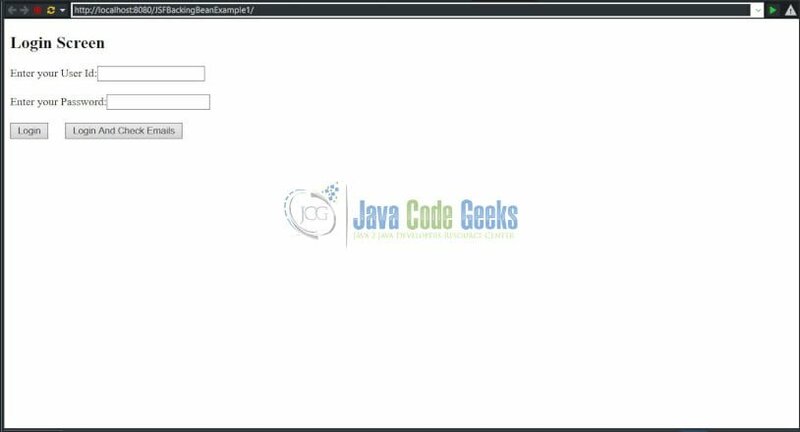 The below screen shows that the User entered the valid User Id as “Java” and Password as “CodeGeeks”. The User is clicking Login button. 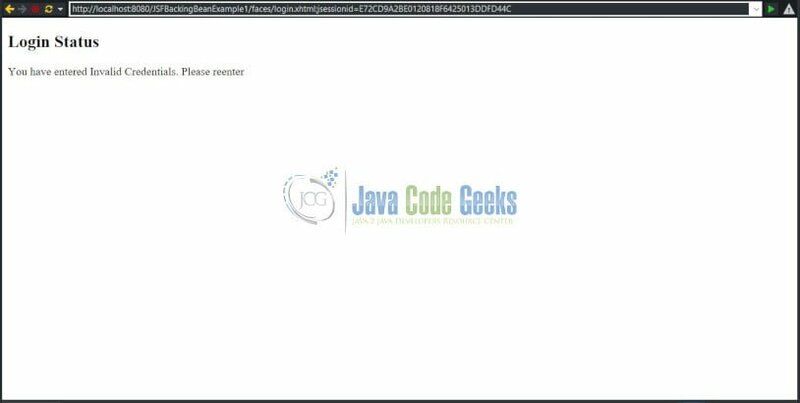 The below screen shows that the User has not successfully logged into the application due to Invalid Credentials been entered by the User. 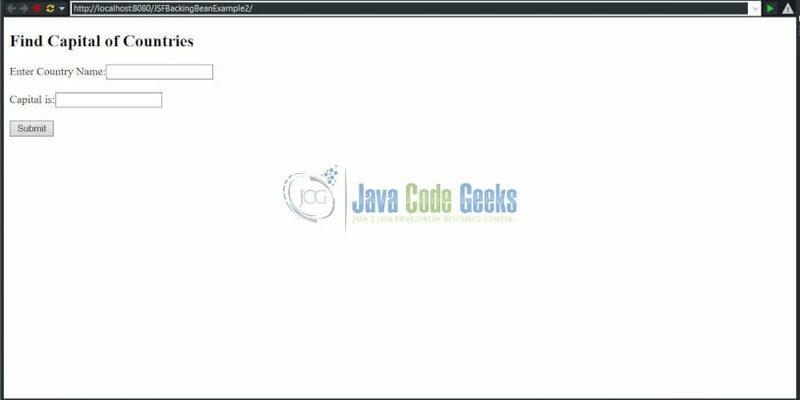 The below Screen shows that the User entered valid credentials (User Id: Java and Password: CodeGeeks) and clicking “Login and Check Emails” button. The below screen shows that the user has successfully logged into the application and displays a message ” You have 32 Emails in your Inbox”. The below screen shows that the User has entered Invalid Credentials and clicking “Login and Check Emails” button. The below screen displays a message to the User that the User has not successfully logged into the application. 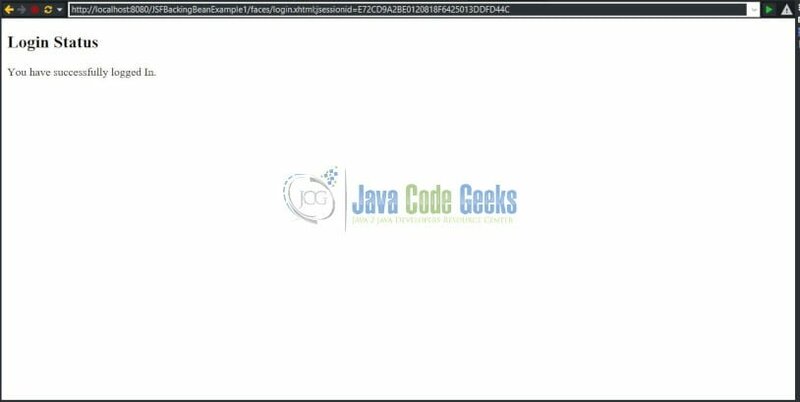 Login.java is a backing bean which is registered as a Managed Bean. The Login bean Component is used to temporarily store the User ID and Password. Login bean will also contain the action methods (LoginAction and LoginCheckEmailAction) that will validate the submitted user ID and password values to determine the navigation outcome (Success or Failure). <h:commandButton value="Login And Check Emails"
login.xhtml file have components InputText, InputSecret and CommandButtons. The action methods will be invoked when the commandButtons (Login or Login and Check Emails) are clicked. 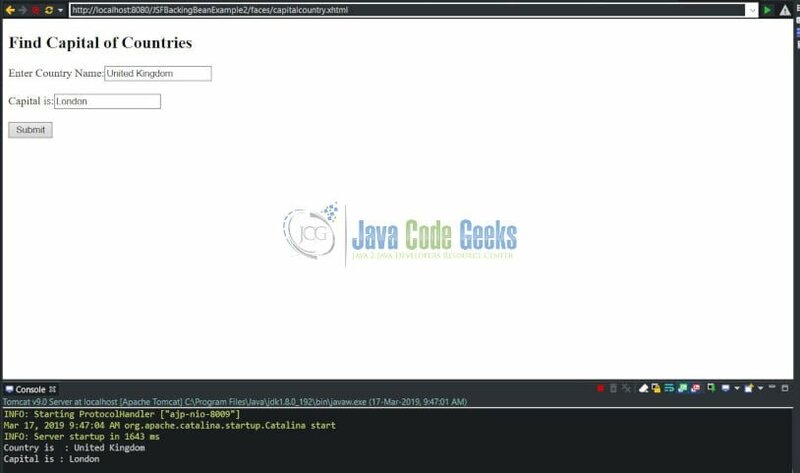 It will return a “SUCCESS” String value if user id and password equals “Java” and “CodeGeeks” respectively. Otherwise, it will return “FAILURE”. 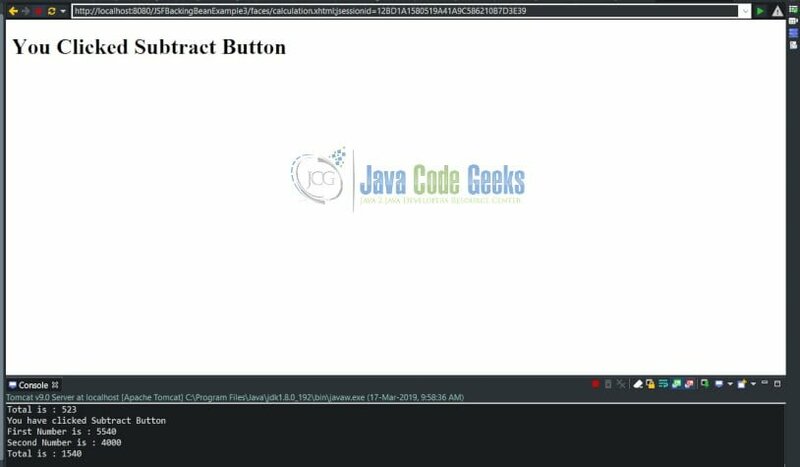 success.xhtml file will display a message as “You have Successfully logged In” only if the user enters valid credentials and on clicking “Login” Command button. failure.xhtml file will display a message to the User as “You have entered Invalid Credentials. Please reenter”, if the User enters Invalid Credentials and on clicking Login button. checkemail.xhtml file will display a screen containing a message as “You have 32 emails in your Inbox” only if the user enters valid credentials and on clicking “Login and Check Emails” Command button. The Navigation rule for Login Button and Login and Check Email Button have been defined in the faces-config.xml file. It displays a Capital Name in a Text Box Component after the user enters Name of the Country in a Text Box Component and on clicking Submit button Component. When the User enters “United Kingdom” as a Country Name and on clicking Submit button, It displays “London” as a Capital in the Capital Text Box Component. When the User enters “India” as a Country Name and on clicking Submit button, It displays “New Delhi” as a Capital in the Capital Text Box Component. When the User enters “Spain” as a Country Name and on clicking Submit button, It displays “Madrid” as a Capital in the Capital Text Box Component . The below screen allows the user to enter Country Name and view the Capital for that country on clicking Submit button. The below screen accepts the Country Name entered by the User and allows the user to click submit button. The below screen displays the Capital name on clicking submit button for the Country name entered by the user and also display the Country and Capital Name on console screen. The below screen shows that User entered a Invalid Country Name and trying to click Submit Button. The below screen displays an error message in the Capital textbox as “Unknown Country” on clicking submit button because the user entered an Invalid Country Name. 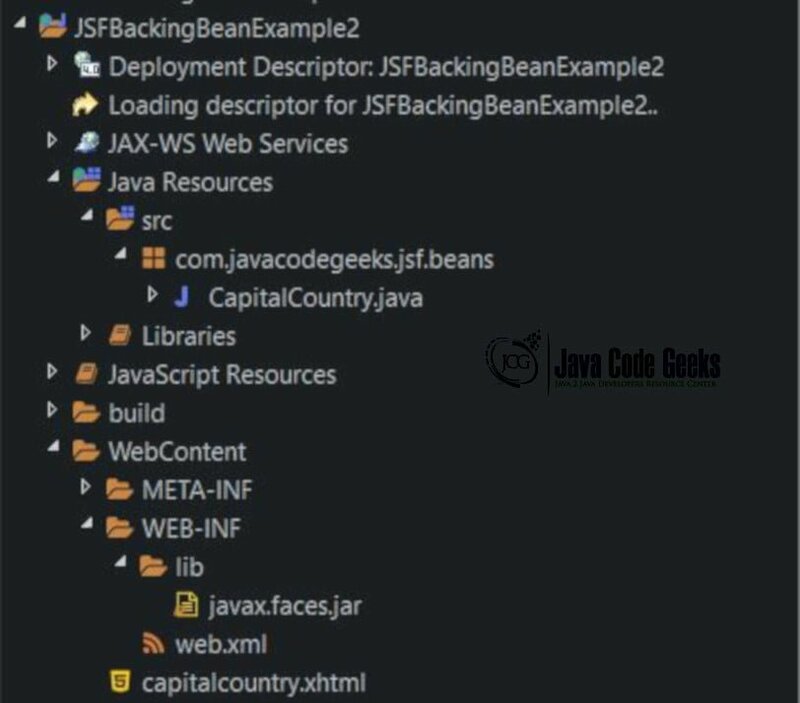 This Capital of Countries Backing Bean example will have the following files: CapitalCountry.java, capitalcountry.xhtmland web.xml. CapitalCountry.java – It is a backing bean component that contains listener methods and business logic methods. CapitalCountry.java is a backing bean which is registered as a Managed Bean. The CapitalCountry bean is used to temporarily store the values of Country Name and Capital Name. CapitalCountry bean will also contain the actionlistener and methods (findCapitalListener and findCapital) that will validate the submitted Country Name and display the Capital for that Country in the Textbox Component. capitalcountry.xhtml has two InputText components and one Command Button Component capitalcountry.xhtml – It contains User Interface components such as Text Components (Country Name and Capital) and one Submit Button. It has event listener methods. It accepts Country Name and displays Capital for the Country after clicking the Submit Button. web.xml – The Faces Controller is implemented as a servlet that responds to all the User requests conforming to a specified URL pattern, such as /faces/*, as defined in the web.xml file. A request from the User that uses the appropriate Faces URL pattern can be considered a “Faces request,” and when received by the Faces Controller, it processes the request by preparing an object known as the JSF context, which contains all the application data and routes the User to the appropriate View component (JSF page). This Calculator Backing Bean example will accept the two numbers (first number and second number). It will add, subtract or multiply these two numbers based on the buttons (Add, Subtract or Multiply) clicked by the User. 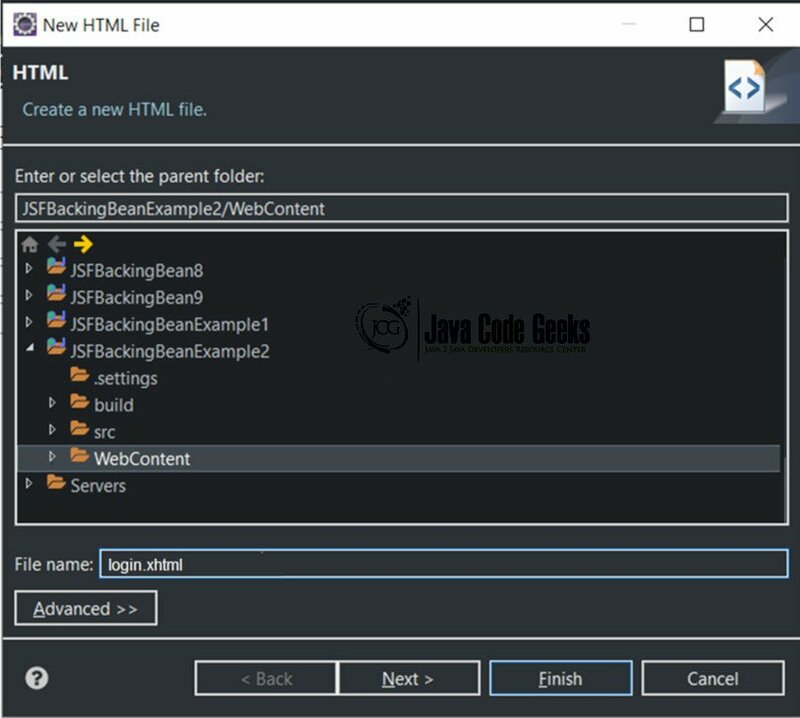 This Calculator Backing Bean example will have the following files: Calculation.java, AddActionListener.java, MultiplyActionListener.java, SubtractActionListener.java, calculation.xhtml, add.xhtml, multiply.xhtml, subtract.xhtml and web.xml. The below screen displays the User to enter First Number and Second Number and also allows the user to do any calculation (Add, Modify or Subtract) with the entered first and second number by the User. The below screen accepts the First Number and Second Number from the User and the user is clicking the Add button. 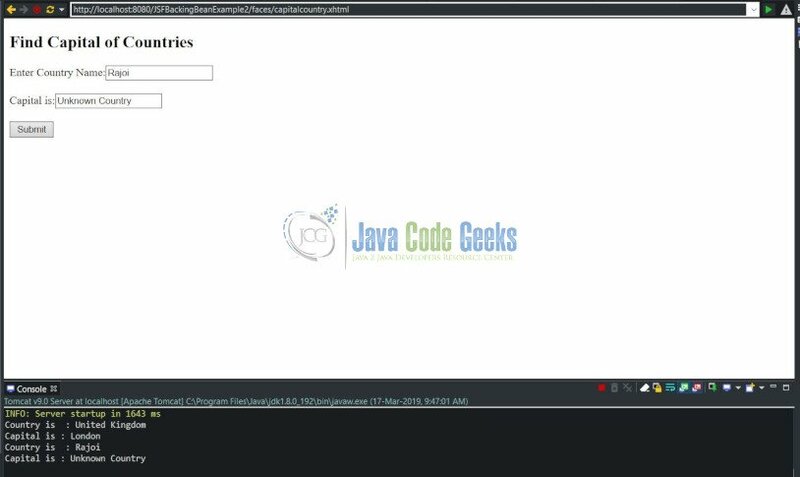 The below screen displays a Screen containing a message “You clicked Add button” and also displaying the total on the console output by summing the first and second number entered by the User. The below screen accepts the first and second number and the User is trying to click the Subtract button. The below screen displays a screen containing a message to the User that “You clicked Subtract Button” and displays a console output showing the subtraction by subtracting the first number with second number entered by the User. The below screen accepts the first and second number from the User and the User is clicking the Multiply button. The below screen shows that it displays screen containing a message to the User that “You clicked Multiply button” and also displays a console output showing the multiplication of the first number with the second number. 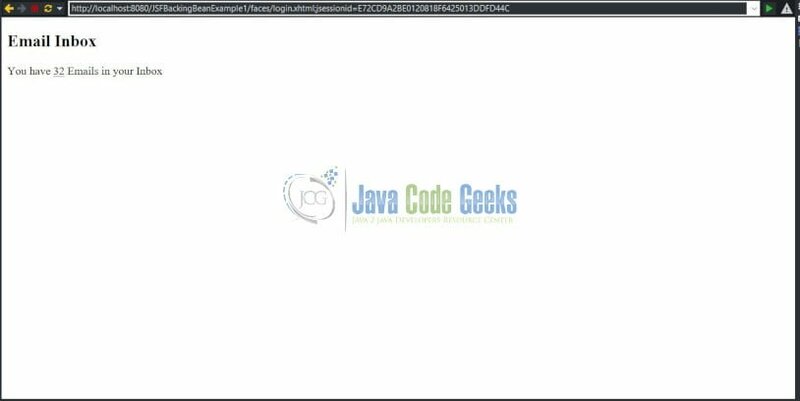 Calculation.java is a backing bean which is registered as a Managed Bean. The Calculation backing bean is used to temporarily store the two Values (first Number and Second Number). It will also contain the methods (calcAdd, calcSubtract, calcMultiply). It also contains AddActionListener, MultiplyActionListener and SubtractActionListener classes. 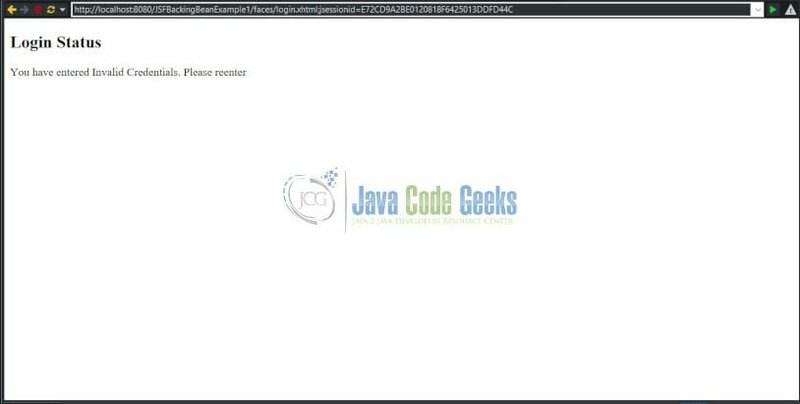 AddActionListener.java will be invoked when the User Clicks on Add Button. It will display a message as “You have clicked Add Button” on the console. 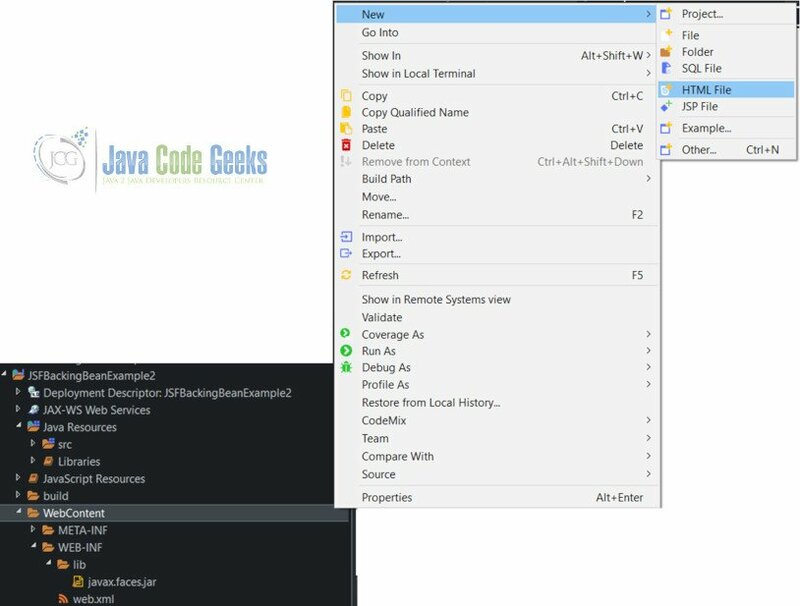 ModifyActionListener.java will be invoked when the User Clicks on Modify Button. It will display a message as “You have clicked Multiply Button” on the console. 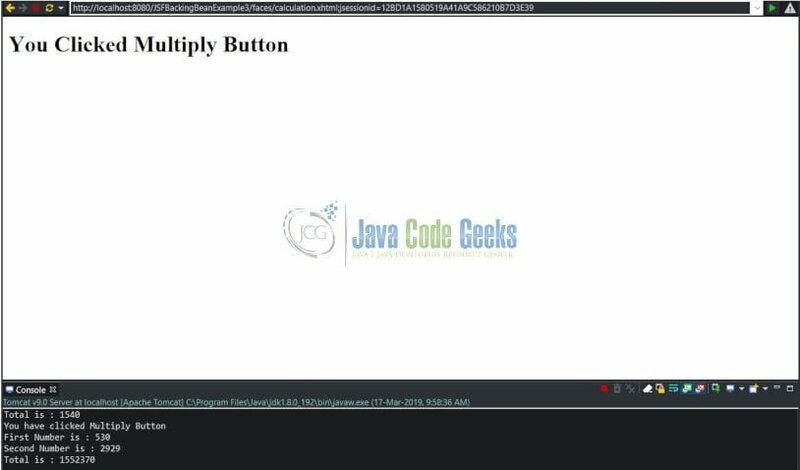 SubtractActionListener.java will be invoked when the User Clicks on Subtract Button. It will display a message as “You have clicked Subtract Button” on the console. calculation.xhtml file has two InputText and three Command Button (Add, Multiply and Subtract) Components. It will call the Add or Modify or Subtract Action listeners based on the buttons (Add, Multiply or Subtract) clicked by the User. add.xhtml – It is used to display the message “You clicked Add Button” after the user clicks the Add Button. subtract.xhtml – It is used to display the message “You clicked Subtract Button” after the user clicks the Subtract Button. multiply.xhtml – It is used to display the message “You clicked Multiply Button” after the user clicks the Multiply Button.